FAQ: Do you have tanks for short term potable water storage? Question: Good Afternoon, I am interested in receiving a quote on one of your portable water tanks, preferably one that can hold about 50,000 gallons of storage capacity. I need something that I can use for temproary potable water storage while I clean the long-term tank. Please advise and provide product price. Is this portable or stationary? Answer: Thank you for your inquiry. For a water storage tank in the size that you have requested (50,000 gallons), the best product option would probably be one of our collapsible storage units. 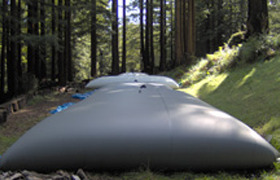 These tanks are flexible, reliable, and can be built in capacities as large as 250,000 gallons. In terms of mobility, these tanks can be transported as long as the tank is not filled. When a tank is empty, the item can be folded up and placed inside a box, in the back of truck, or in various other devices to move the unit. Their ability to be easily folded and moved is one of the many advantages of these tanks. However, when the tank is filled, it will be significantly larger in size as well as significantly heavier. For this reason, the Pillow Tanks are not designed for transportation while they are filled with any kind of liquid. This information can help us choose the best temporary storage tank fabric for your application. Depending on how temporary your storage requirements are, tanks will most likely be produced with a contact time of about 1 year.